UNESCO’s Intergovernmental Committee for the Safeguarding of Intangible Cultural Heritage has just announced this year’s additions to its Representative List of the Intangible Cultural Heritage of Humanity. Among the winners is an entry that was submitted by the Japanese government in 2012: ‘Washoku, traditional dietary cultures of the Japanese, notably for the celebration of New Year’. The category of Intangible Cultural Heritage was established with the aim of protecting performing arts, local rituals, festivals and other traditional practices, knowledge and skills, with the ultimate goal of helping to maintain cultural diversity in the face of globalization. In 2010 UNESCO began adding culinary traditions to this list, which has been met with increasing criticism. Voices question the desirability and feasibility of the initiative, along with the lack of transparency of the selection process. Critics argue that with the aid of UNESCO, the local foods of various countries are increasingly turning into tourist attractions – idealized and aestheticized images of the past far removed from the real lived experiences of people today. This also holds true for washoku. As I argue in my book Modern Japanese Cuisine, Japanese cuisine as it is projected and valued today is a modern construct conceived in the midst of the historical dynamics of the twentieth century. Even the term washoku, nowadays saturated with a sense of timeless continuity and authenticity, is a modern invention. 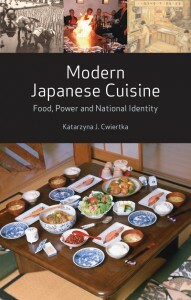 It emerged in the late nineteenth century in response to the encroachment of foreign food on Japanese culinary discourse and dietary practices. Instead of celebrating this fascinating case of cultural appropriation, culinary publicists, cooks and recently the Japanese government itself tend to drape Japanese cuisine in an aura of exoticism and traditionalism. The label ‘Intangible Cultural Heritage’ approved by UNESCO makes the cultivation and persistence of the myth of Japanese cuisine as a refined, time-honoured philosophy and practice, soaked with aesthetic qualities and healthy attributes easier than ever. Interestingly, the reference to the Japanese food traditions related to the celebration of New Year, which formed the core of the washoku application for Intangible Cultural Heritage status, have been entirely lost in media accounts of the UNESCO award. To read the UNESCO announcement of the award please click here. Read the original article at Reaktion Books.